A remote control for a television set. A remote control (also referred to as a "remote" or "controller") is an electronic device used for the remote operation of a machine. Remote controls are commonly used to issue commands from a distance to televisions, DVD players, stereo systems, and other consumer electronics devices. Remote controls for these devices are usually small, wireless, hand held objects with an array of buttons to adjust such settings as the television channel, track number, and volume. For the majority of modern systems with this type of controller, the remote contains all the function controls while the controlled device itself has only a handful of essential primary controls. The controllers for electronic appliances usually emit infrared signals that reach the appliance, but some controllers emit radio frequency signals. A pile of assorted remote controls. One of the earliest examples of a remote control was developed in 1893, by Nikola Tesla. He described it in his patent, named Method of an Apparatus for Controlling Mechanism of Moving Vehicle or Vehicles. In 1903, Leonardo Torres Quevedo presented the Telekino at the Paris Academy of Science, accompanied by a brief, and conducted an experimental demonstration. In the same year, he obtained patents for it in France, Spain, Great Britain, and the United States. The Telekino consisted of a robot that executed commands transmitted by electromagnetic waves. In this manner, Torres pioneered the field of remote control. In 1906, in the presence of the king and a large crowd of observers, Torres successfully demonstrated the invention in the port of Bilbao, guiding a boat from the shore. Later, he tried to apply the Telekino to projectiles and torpedoes, but he abandoned the project due to lack of funding. The first remote-controlled model airplane was flown in 1932. During World War II, intensive work was done on the use of remote control technology for military purposes, and one result of that was the German Wasserfall missile. By the late 1930s, several radio manufacturers offered remote controls for some of their higher-end models. Most of them were connected to the set being controlled by wires. However, in 1939, the Philco Mystery Control was manufactured as a battery-operated, low-frequency radio transmitter, thus making it the first wireless remote control for a consumer electronics device. An assortment of remote controls for TV, VHS, and DVD devices. 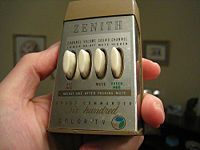 The first remote intended to control a television set was developed by Zenith Radio Corporation in 1950. The remote, officially called "Lazy Bones," was connected to the television set by a wire. To improve on this setup, a wireless remote control called "Flashmatic" was developed in 1955, which worked by shining a beam of light onto a photoelectric cell. Unfortunately, the cells did not distinguish between light from the remote and light from other sources, and the Flashmatic had to be pointed very accurately at the receiver. The Zenith Space Commander 600 remote control. In 1956, Robert Adler developed "Zenith Space Command," a wireless remote. It was mechanical and used ultrasound to change the channel and volume. When the user pushed a button on the remote control, it clicked and struck a bar, hence the term "clicker." Each bar emitted a unique frequency detected by circuits in the television set. Invention of the transistor made it possible to produce cheaper electronic remotes that contained a piezoelectric crystal fed by an oscillating electric current at a frequency near or above the upper threshold of human hearing, though still audible to dogs. The receiver contained a microphone attached to a circuit that was tuned to the same frequency. Some problems with this method were that the receiver could be triggered accidentally by naturally occurring noises, and some people, especially young women, could hear the piercing ultrasonic signals. In one notable incident, a toy xylophone changed the channels on these types of TVs because some of the overtones from the xylophone matched the remote's ultrasonic frequency. The impetus for a more complex type of TV remote control came in the late 1970s, with the development of the Ceefax teletext service by the BBC. Most commercial remote controls at that time had a limited number of functions, sometimes as few as three: Next channel, previous channel, and volume (with on/off). This type of control did not meet the needs of teletext sets, where pages were identified with three-digit numbers. A remote control to select teletext pages would need buttons for each number from zero to nine, as well as other control functions, such as switching from text to picture, and the normal TV controls of volume, station, brightness, color intensity, and so on. Early teletext sets used wired remote controls to select pages, but the continuous use of the remote control required for teletext quickly indicated the need for a wireless device. So, BBC engineers began talks with one or two television manufacturers, leading to early prototypes (around 1977-78) that could control a much larger number of functions. ITT was one of the companies and later gave its name to the ITT protocol of infrared communication. In the 1950s, remotes were upgrade options for T.V. sets. Zenith, mentioned above, was ready to change the lives of "lazy" people for good. The initial purpose of the T.V. remote was to turn off the T.V. set from afar and to change the channels or mute commercials. People were told that the remote could turn off the T.V. while they were still lying in their LaZBoy and thus could drift off to sleep without interruption. A common complaint, however, was that people tripped on the cable attached to those early remotes. Development of the Flashmatic (Zenith's first wireless remote) took care of that problem, but it led to another type of frustration: If sunlight hit the T.V. set, the channel would change. The remote gave viewers an opportunity to “arm” themselves with the ability to change their minds about what they were watching, without bothering to get up to change the channel. The remote’s technology started something new for the everyday T.V. viewer: The "joystick." The joystick allowed people to interact with their T.V., going beyond the kinds of interactions they had earlier with their television sets. Pong—the game in which people first used joysticks—was based on Ping-Pong. This new technology gave T.V. viewers the ability to manipulate pixels on the T.V. screen for the first time. Invention of the remote control has led to various changes in television programming. For example, it led to the creation of split screen credits. According to James Gleick, an NBC research team discovered that when the credits started rolling after a program, 25 percent of viewers would change the channel before it was over. Because of this, the NBC 2000 unit invented the “squeeze and tease,” which squeezed the credits onto one third of the screen while the final minutes of the broadcast aired simultaneously. The remote control also led to an adjustment in commercial airings. Networks began to feel that they could not afford to have commercials between programs because it would detract viewers from staying tuned in on their channel. Programmers decided to place commercials in the middle of programs to allow for direct transition into the next show. Aware that people were equipped with remotes, networks cut 30-second advertisement spots into segments of eight seconds or less. MTV was made up of this high-speed and broken cutting style, which aired music videos that were around three-minutes and each shot no more than two or three seconds. When it was thought that even these three-minute segments were too long, MTV created an animated series called Beavis and Butthead to keep their viewers' attention. In the program, they would show segments of music videos and then switch back to the characters and offer dialog and action while the music video played in the background. Beavis and Butthead was purposefully stagnant, with slow dialog and dependent on reaction shots, but animation took the most management and pacing was found to be "everything." The last fraction of a second of sound track was overlaid with the first fraction of a second of the visual track for the next scene. In the 1980s, Steve Wozniak of Apple Inc. started a company named CL 9. Its purpose was to create a remote control that could operate multiple electronic devices. The CORE (Controller Of Remote Equipment) unit, as it was named, was introduced in the fall of 1987. The advantage of this remote controller was that it could “learn” remote signals from various other devices. It also had the ability to perform specific or multiple functions at various times with its built-in clock. It was also the first remote control that could be linked to a computer and loaded with updated software code as needed. The CORE unit never made a huge impact of the market. It was much too cumbersome for the average user to program, but it received rave reviews from those who could figure out how to program it. These obstacles eventually led to the demise of CL 9, but one of its employees continued the business under the name Celadon. This was one of the first computer-controlled learning remote controls on the market. By the early 2000s, the number of consumer electronic devices in most homes greatly increased. According to the Consumer Electronics Association, an average American home has four remotes. To operate a home theater as many as five or six remotes may be required, including one for cable or satellite receiver, VCR or digital video recorder, DVD player, TV, and audio amplifier. Several of these remotes may need to be used sequentially, but because there are no accepted interface guidelines, the process is increasingly cumbersome. Many specialists, including usability specialist Jakob Nielsen and Robert Adler, inventor of the modern remote, have noted how confusing, unwieldy, and frustrating the multiplying remotes have become. The modulation of the IR diode varies by button. Most remote controls for electronic appliances use a near infrared diode to emit beams of light that reach the device. 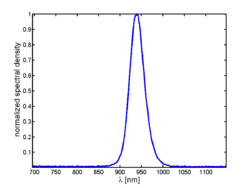 An LED emitting at a wavelength of 940 nanometers (nm) is typical. This infrared light is invisible to the human eye but carries signals that are detected by the appliance as well as by the sensor of a digital camera. Some controllers are operated via radio frequency signals. Remote controls for electronic appliances are usually powered by small AAA or AA size batteries. For a single-channel (single-function, one-button) remote control, the presence of a carrier signal can be used to trigger a function. For multi-channel (multi-function) remote controls, more sophisticated approaches are necessary, such as modulating the carrier with signals of different frequency. After demodulation of the received signal, the appropriate frequency filters are applied to separate the respective signals. Nowadays, digital procedures are more commonly used. One can often hear signals being modulated on the infrared carrier by operating a remote control in very close proximity to an AM radio not tuned to a station. To be turned on by a wireless remote, the controlled appliance must always be partly on, consuming standby power. Studies indicate that around 5-10 percent of domestic electricity is consumed by appliances when they are off. In the average home, 75 percent of the electricity used to power home electronics may be consumed when the appliances are turned off. Remote control is used for controlling substations, pump storage power stations, and high-voltage direct current (HVDC) plants. In these cases, PLC systems working in the longwave range are often used. Remotely controlled machinery is useful for work in radioactive and toxic environments, to prevent adverse health effects on human workers. For example, remotely controlled robots were used during cleanup operations after the Chernobyl disaster. In World War I, the Imperial German Navy employed FL-boats (Fernlenkbootes) against coastal shipping. These were driven by internal combustion engines, controlled remotely from a shore station through several miles of wire wound on a spool on the boat. An aircraft was used to signal directions to the shore station. EMBs carried a high explosive charge in the bow and traveled at speeds of 30 knots. During the 1930s, the Soviet Red Army used remotely controlled teletanks in the Winter War against Finland and the early stages of the Great Patriotic War. A teletank is controlled by radio from a control tank at a distance of 500–1,500 meters, the two constituting a telemechanical group. The Red Army fielded at least two teletank battalions at the beginning of the Great Patriotic War. There were also remotely controlled cutters and experimental remotely controlled planes in the Red Army. Remote control technology is used in space travel. For instance, the Russian Lunokhod vehicles were remote-controlled from the ground. However, direct remote control of space vehicles at great distances from Earth is not practical because of increasing delay times of the signals. Video game consoles were not operated with wireless controllers until recently, mainly because of the difficulty in playing the game while keeping the infrared transmitter pointed at the console. Early wireless controllers were cumbersome, and, when powered with alkaline batteries, lasted only a few hours before needing replacement. Some wireless controllers were produced by third parties, in most cases using a radio link instead of infrared. Even these were very inconsistent, and in some cases had transmission delays, making them virtually useless. The first official wireless controller made by a first-party manufacturer was the WaveBird for Nintendo Gamecube. The Wavebird changed the face of wireless technology in video game consoles. In the current generation of gaming consoles, wireless controllers have become the standard. Remote-controlled toys, such as racing cars, boats, and aircraft, are a favorite pastime for many people. Remote-controlled airplanes serve as a great hobby for all ages. The plane has the same fuselage as a real plane, and it flies just as well. A small, electric motor generates thrust, and the wings are in airfoil form that create high- and low-pressure regions to produce lift. The operator on the ground controls the transmitter (radio), which sends signals to the receiver on the plane. The receiver gives commands to the rudder, ailerons, elevators, and so forth. The plane is controlled by various channels. For example, channel 2 is mostly for beginners and the plane is controlled through its rudder and elevators. Channel 3, for beginners and experienced pilots, provides control over the motor speed, which sets the pitch. Channel 4 helps control the ailerons, allowing for smooth turns. Channels 5-8 are for such controls as gearing up and down, but they are not essential. There are different types of remote-controlled planes, including biplanes, fixed wing, jets, turbine jets, and so forth, but they all operate in the same way. The turbine plane is powered by a small turbine that works the same way as a real turbine but is much smaller. This "mini-turbine" is very powerful. The more common RC planes are operated with electric or nitro power. RC planes come in wingspans ranging from 8 centimeters to more than 5 meters. Although remote-controlled planes provide a lot of fun, there are tricks on how to fly them and those who wish to begin this hobby need to read the forums on which planes to buy and how to fly them. ↑ U.S. Patent 613809 (PDF). Retrieved June 20, 2008. ↑ Philco Repair Bench, Philco Mystery Control. Retrieved June 20, 2008. ↑ 3.0 3.1 Zenith, Five Decades of Channel Surfing: History of the TV Remote Control. Retrieved June 20, 2008. ↑ Paul Farhi, The Inventor Who Deserves a Sitting Ovation, Washington Post. Retrieved June 20, 2008. ↑ SB Projects, SB-Projects: IR remote control: ITT protocol. Retrieved June 20, 2008. ↑ Mary Bellis, The History of the Television Remote Control. Retrieved June 20, 2008. ↑ Douglas Rushkoff, "Renaissance Now! Media Ecology and the New Global Narrative," in Living in the Information Age by E. Page Bucy (Belmont, CA: Wadsworth Thomson Learning, ISBN 9780534633400), p 25. ↑ Steven L. Kent, The Ultimate History of Video Games (Roseville, CA: Prima Pub, 2001, ISBN 9780761536437), p 27. ↑ James Gleick, "Prest-O! Change-O!" in Living in the Information Age by E. Page Bucy (Belmont, CA: Wadsworth Thomson Learning, 2005, ISBN 9780534633400), p 147. ↑ Gleick (2005), p 148. ↑ Gleick (2005), p 149. ↑ Gleick (2005), p 150. ↑ Celadon, Celadon Remote Control Systems Company Profile Page. Retrieved June 20, 2008. ↑ Jakob Nielsen, Jakob Nielsen's Alertbox: Remote Control Anarchy, Alertbox. Retrieved June 20, 2008. ↑ U.S. Department of Energy, Home Office and Home Electronics. Retrieved June 20, 2008. ↑ C.H. Lightoller, Titanic and Other Ships (London: I. Nicholson and Watson, 1935). Bucy, E. Page. 2005. Living in the Information Age: A New Media Reader, 2nd edition. Belmont, CA: Wadsworth Thomson Learning. ISBN 9780534633400. Gonzalez, Barb. 2005. The Home Electronics Survival Guide. The Simple Guide to Understanding, Hooking Up, and Buying TVs, HDTVs, DVDs, Home Theater, Remote Controls and More. Volume 1. Cedar Ridge, CA: Home Electronics Survival. ISBN 978-0976489405. Kent, Steve L. 2001. The Ultimate History of Video Games: From Pong to Pokémon and Beyond: The Story Behind the Craze That Touched Our Lives and Changed the World. Roseville, CA: Prima Pub. ISBN 9780761536437. Lumby, Catharine, and Elspeth Probyn. 2004. Remote Control: New Media, New Ethics. Cambridge: Cambridge University Press. ISBN 0521534275. Sayers, Craig. 1998. Remote Control Robotics. New York: Springer. ISBN 0387985972. All links retrieved July 8, 2015. 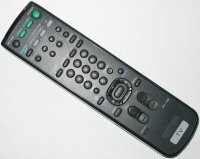 New Remote's History of the Remote Control. This page was last modified on 8 July 2015, at 22:06.